Jeanne (Jane) Barker Pierce passed away quietly in her home in Lexington, North Carolina on Tuesday, February 12, after an extended illness. She was born on July 17, 1932, in Torrington, Litchfield County, Connecticut, the second child of eleven, to Florance Bozenhard Barker and Haworth Wadhams Barker. Upon graduating from high school at 16, Jeanne attended the American International College in Massachusetts for two years. She later served her country in the United States Naval Reserve (Women's Reserve), better known as the WAVES (for Women Accepted for Volunteer Emergency Service). 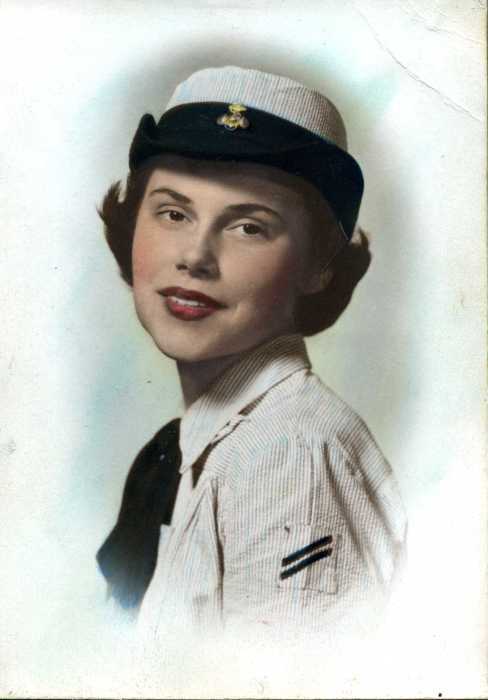 She was stationed at the Naval Hospital in Great Lakes, Illinois from 1950 to 1952. Jeanne was the widow of Bobby Gilmer Pierce (d. 2006) and the daughter-in-law of Everett Gilmore Pierce (d. 2005) and Eunice Smith Pierce (d. 1985), all of Lexington. The couple is survived by their three children, Gil Pierce (Karen Martin Pierce) of Denton, Rebecca Pierce of Lexington, and Connie Crabtree (Mike Crabtree) of Asheboro. Jeanne has two grandchildren, Landon Chase Pierce (Leanna Peedin Pierce) of Cary and Lara Adams Awad (Hussam Awad) of Concord, and three great-grandchildren, Adam and Sarah Awad of Concord, and Cameron Oldham of Myrtle Beach, South Carolina. Jeanne served as Claims Supervisor for the Employment Security Commission of North Carolina for more than twenty-five years. Following her retirement, she was an active volunteer in her community. She was a board member of the South Davidson Family Resource Center from its inception and volunteered in its food pantry for many years. She also delivered for her local Meals on Wheels. She was an active member and officer of the Silver Valley Home Extension Club until her health began to fail. Jeanne believed charity begins at home, and she supported many local charities, as well as the local branches of national organizations that extend help and service to others in times of need. An avid reader and craftsperson, Jeanne loved cozy mysteries and enjoyed basket weaving, wood carving, painting and ceramics. She was an armchair birdwatcher, often sitting at the window or on her deck with binoculars, identifying and noting sightings in the margins of her Audubon books. In the last months of her life, Jeanne was reunited through e-mails, via Skype, and in person with her surviving siblings and her children from a previous union. This restoration brought her much comfort and peace. A Celebration of Life service will be held at Fairview United Methodist Church in Denton, North Carolina on Saturday, February 23 at 11:30 a.m., followed by a luncheon in the fellowship hall. In lieu of flowers, the family asks that donations be made in her honor to Hospice of Davidson County, 200 Hospice Way, Lexington, NC 27292 or your local battered women's shelter.